Growing up in the Canadian Rockies, mountains have always been home. Travelling the world, I’ve always discovered commonalities with mountains - and mountain people. This major project is to run solo and unsupported across a mountain range on every continent where indigenous mountain people live isolated from the outside, urban world. In Kyrgyzstan I met the Kyrgyz nomads, who live a traditional lifestyle in yurts and were overwhelmingly friendly towards me. In the Atlas Mountains, the Berbers were an essential support network who welcomed me into their communities and helped me survive in the incredible hostile desert environment. In the Bolivian Andes, where the first road network was originally stamped out by Inca message runners, I often took shelter from mountain storms in Quechua and Aymara pueblos, where I was always welcomed despite the constant danger warnings against the region. Running solo and unsupported comes with obvious logistical as well as physical challenges, and travelling in this way forces my dependence on the small communities inhabiting these remote regions. Running is also a common language - all people around the world do it - and has always helped me build an instant rapport with the people along the way. This is more than a really long way to run. It’s a series of expeditions, where, in addition to the physically challenging task of running over mountain ranges, I have to arrange my own logistics in a foreign country, navigate the wilderness, carry all of my own equipment, and find a way to survive. In all honesty, running is the easy part. The months leading up to each expedition are spent training hard to build excess muscle mass to cope with the extra pack weight, while pouring over maps and resources. Satellite images may help me to find remote communities, water sources, or impassable grades. Still, running in remote areas where perhaps no one has ever attempted a traverse before comes with little guarantee, and through years of mountain experience I have acquired the skills and the resilience to pursue a route where no path exists. I am now 4/6 on my mission to complete a mountain range on every (populated) continent, but I'll need help to get the next three. If your business would like to hear more about how we can work together to make this project a success, please get in touch with me. "Tamazight" means 'free people', and is what the Berbers call themselves in their own language. 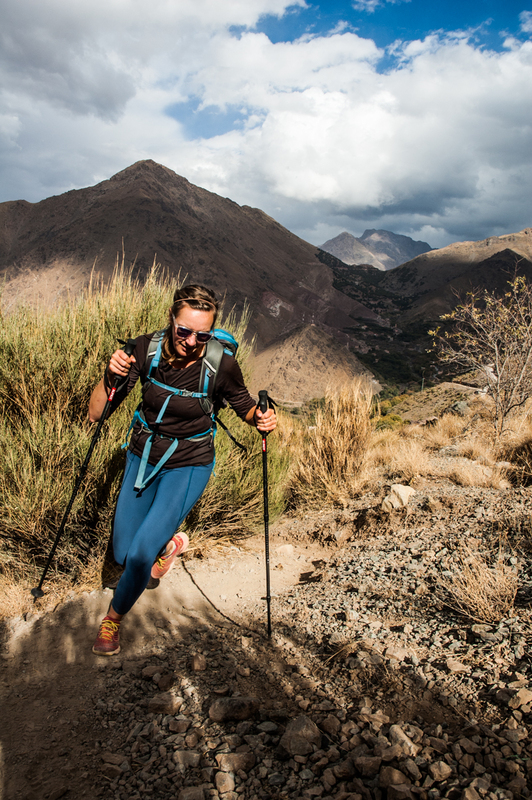 In October 2017, Jenny Tough ran solo and unsupported across the High Atlas Mountains, a place still populated by the Tamazight, but patrolled by the Moroccan Gendarmerie. On September 18, 2016, I ran - somewhat stonkered - through the city gates of Osh, in the southwest of Kyrgyzstan, having run just over 900 kilometres in 25 days from the northeast city of Karakol via the Tien Shan mountains, solo and self-supported.